Couple of years back I saw a TV program which talked about the goodness of Avocado and in that enthusiasm I tried out Avocado chutney. We all liked it but somehow Avocados never became a regular fruit at home. And yes, Avocado is a fruit (but usually listed under Vegetables) which is pear shaped and is sometimes called 'Alligator Pear'. They help in lowering cholesterol. Avocados are a good source of vitamin K, dietary fiber, vitamin B6, vitamin C, folate and potassium. They make for a good bread spread too. Cut the Ripe Avocado and remove the seed and scoop out the pulp . Mash the pulp with a spoon and mix well. In a hot skillet, add 1/2 tsp of oil and saute the finely chopped onions and mix it in the Avocado pulp. Make a paste of chopped tomato, green chillies, garlic pods and coriander leaves and slightly saute in 1/2 tsp oil for 2 min. Mix it into the mashed pulp. In the same skillet add oil and add all the seasoning and after the mustard sputters, add it to the pacchadi. Mix it well and squeeze in the lime juice. Note - Lime juice can be substituted with tamarind pulp. Raw onions can be used instead of the sauteed ones. Same goes with the tomatoes. This goes to Niloufer Riyaz's Twenty-20 Cooking Event. This is my husband's favorite Okra recipe and I make it pretty often. As kids, we were encouraged to eat them as they were supposed to sharpen our brains. Now, I know why they said so. Okras are an excellent source of dietary fiber, vitamins and minerals. Fresh okra pods are great anti-oxidants and rich in Vitamin C. I saw several recipes for this but really didn't like any of them. I read through all of them and finally arrived at my own version of this delightful curry. I usually substitute red chilly powder with green chillies as they don't cause heartburn and don't irritate the digestive system. And I use Amchur powder for almost all the North Indian dishes. Here's how I make it. Add 1 tsp of oil in the pan and fry the okras till tender. Ensure that the ends are intact and don't break. Keep them aside. Add remaining oil into the pan, add jeera into it and wait till it splutters before adding the onions. Saute the onions for 2 minutes and add the tomatoes. Also add salt and turmeric and let the tomatoes cook. Then, add amchur powder, Dhania-Jeera powder, green chillies and ginger powder to it and mix. Finally add the fried Okras to this and add Kasoori methi to it and mix it. Switch off the flame and garnish it with coriander leaves. This idea of a Green apple pickle was from a friend of mine a few years back. That was a time when I had a craving for Mango pickle and it was not a typical mango season. Since Granny smith apples (Green apples) are a little sour, my friend said it would be a good idea to make it to satisfy my craving! And lo! I make this pickle in a jiffy whenever we feel like it! Its a great idea for parties too..Your guests will be fooled into thinking it is made of mangoes!! Wash and dry the Green Apple. Chop it into small pieces. Add salt and turmeric and mix it well. Leave it aside for an hour or so (Optional). Add mustard powder, mirchi powder, methi powder, oil and asofoetida and mix well. Serve this pickle after 7-8 hours (minimum resting time 1 hr) as the flavors will properly get absorbed into the apple pieces. Serve with steaming hot rice and ghee for a satisfying meal. Note - If the apples are not sour enough, lime juice or citric acid can be added. Take another peek at the yummy pickle! My friends invited me for dinner last week and I was wondering if I could make a dessert for them. I had some leftover condensed milk from a previous experiment which turned out bad. I wanted to use it and so I waded through my fridge and found enough carrots to make halwa out of it. For me, no one made Carrot Halwa like my mom. I started grating the carrots wondering if I could match her. This version is probably the simplest way to make carrot halwa. Take two teaspoons of ghee in a thick bottomed pan and add the grated carrots to it and fry them till the raw smell of carrots disappears. This would take about 6 minutes approximately. Now add the 1/2 tin of condensed milk and some more ghee to it and keep mixing it at regular intervals on a medium flame till the carrot mixture turns color and becomes a thick lump. Turn off flame and garnish it with cashews roasted in ghee. Serve it hot or cold according to your preference. We served it with ice cream and it was really tasty. You could give it a try too! I follow my her recipe to the T. Needless to say I 'almost' get the same flavor which is a compliment in itself (commented by my mother-in-law herself!). Rasam made out of this powder is bound to be addictive!! I have friends requesting me to make this rasam for parties! All due credit to my dear mother-in-law. In a hot skillet, dry roast Dhania, Jeera, Chana dal, Toor dal, Pepper, Rathi Puvvu, Marathi Mogga, Methi Seeds, Urad dal, Dry red chillies and Curry leaves. In the same skillet, add 1/2 tsp of ghee and fry the mustard seeds, take them off just before they splutter and add hing to it. While they are still slightly warm, grind all of the above to make a fine powder. Add 1/2 tsp of salt to the powder to retain the freshness for a long time . I recently saw the CWS event hosted by Priya of Priya's Easy and Tasty Recipes and thought it was a nice idea to have an event exclusively for spices. It luckily came at the right time for me and I wish to send my Rasam powder as my entry to the CWS-Coriander Seeds theme hosted by RV of Sourashtra Kitchen. Dhania Kaaram podi is an authentic spice powder handed down to me by my mother-in-law. My mother-in-law comes from a family of traditional ayurvedic physicians and she herself is into it. Apparently this powder has been made for generations in the family. This is especially beneficial for new moms - Speeds up the healing process. Since ages, Coriander is known to be very good for health and therefore has been included in all the traditional recipes made. The medicinal properties of Coriander have been popularized in recent years. Coriander is known to be anti-inflammatory and the decoction made out of it is used to relieve sore throat. Dry roast Dhania, Jeera, Methi seeds, Chana dal, Urad dal, Curry leaves, Red chillies and Tamarind separately. Upon cooling grind all of them into a coarse powder. Grind garlic pods also and mix well adding salt , turmeric and Jaggery as per taste. Store in an air tight container and serve with steaming hot rice and ghee! I recently saw the CWS event hosted by Priya of Priya's Easy and Tasty Recipes and thought it was a nice idea to have an event exclusively for spices. It luckily came at the right time for me and I wish to send my Dhania spicy powder as my entry to the CWS-Coriander Seeds theme hosted by RV of Sourashtra Kitchen. The first time I tasted Pudina rice was at a friend's place and took an instant liking to it. I never prepared it since my husband wasn't too enthusiastic about the idea. With its anti-oxidant properties and lots of essential vitamins and minerals (including folic acid, an essential nutrient for women), mint has known to have been a cure for indigestion and various studies have also shown that it also has certain anti-cancer properties. Recently, I have been trying to cook various foods with Pudina for my son and what better than Pudina rice to feed him! Heat a teaspoon of oil in a pan and add the pudina leaves and green chillies and saute them till the raw smell of mint fades away. Grind the Mint/Pudina leaves, coriander leaves, green chillies in a mixer. Heat oil in a wide bottomed pan and when slightly hot, add the whole Garam Masala and fry it for a few seconds. Add the Ginger-garlic paste to this and the add the onions and saute them for a few minutes. Add the Pudina mixture and salt to this and fry for a minute or two. Now, add the Basmati rice along with the water and let it cook till the rice is done or transfer the entire mixture into a rice cooker and cook. That's it. Pudina rice is ready to be served with raita. Back home, fresh red chillies (not the dried ones) are used to make a kind of pickle (also known as pandu mirapa kaya pacchadi). Few years back, I heard from a friend that these red bell peppers can also be used in making chutney. Thats when I started making this chutney. Though we like this chutney a lot, I have reduced the usage of peppers as these have been aggravating my heartburn. Had a craving for this chutney, so it made its way into my kitchen today. Anyway, Red bell peppers are rich in Vitamins A and C and also Folic acid though they might not be a great option for people with heartburn. They help in reducing the risk for heart disease and they also have cancer fighting capability. Moreover the chutney can be tweaked to suit individual taste. Some would like to add Roasted peanuts, or onions or tomatoes. This is how I prepared today..
Wash the red bell pepper, remove the seeds and chop it into 1 inch pieces. In a skillet, heat oil and fry the seasoning items and add the chopped bell peppers and green chillies and saute them until they are semi tender. Add salt and garlic pods, roasted methi powder and coriander leaves and switch off the flame. Upon cooling, make a coarse paste and squeeze in some lime juice. Methi seeds can be used instead of roasted methi powder. I make Rava Payasam to satisfy sudden cravings of my kids who like most kids, change their mind before we even realize. Rava as such is filling and nutritious. So when my kids go on a hunger strike, Rava Payasam is one of the items which can keep them going for a while! So it is definitely a life saver in such cases..Don't we all agree?? Take the Rava in a microwave safe bowl (preferably non-plastic) and roast it in the microwave for about 40-50 secs depending on the wattage of the microwave (I roasted for 40 secs in a 1000 watt microwave oven). Then add sugar and badam mix (I use the MTR Badam Feast available in the Indian stores here). The badam mix can be substituted with plain badam powder and cardamom powder also. Mix well and heat in intervals of 30 secs until the sugar is dissolved. It should take about 2-3 min to get done. Garnish with Badam scrapings, roasted cashews and raisins and serve warm or cold. Back home, whenever we would go out for shopping, there would be a definite stop at the local 'Vijaya Dairy Parlour' where we would have to eat those delicious Doodh pedas and also would carry home some!! All of us were fond of sweets at home and used to polish off the pedas without each other's knowledge...It was great fun!! With such memories in my mind, I had to figure out a fast and easy way to make these pedas. 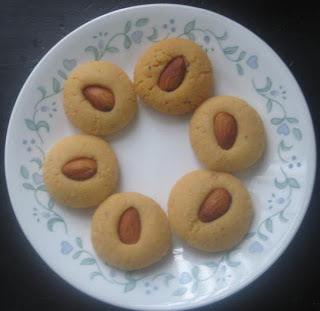 A few years back, my cousin handed me the recipe and to this day Doodh Peda is fairly regular at potluck parties we have out here!! I make this in the microwave, but I guess it can made on the stovetop also (though I never tried). In a Microwave safe bowl (preferably non plastic), empty the Condensed milk can and mix in the milk powder and melted butter. Heat in the microwave in increments of 2 minutes while mixing well in between for two times. Then mix well every minute until the mixture turns light brown and becomes porous. It should take no more than 7 minutes depending on the power of the microwave. When it becomes porous, it is done. Once partially cooled, make it into any desired shape and garnish with Roasted Almonds. Store it in the refrigerator and serve chilled! Morkali is one of the many favorite items of my childhood. Food blogging has inspired me to check into my old recipes handed down by my mom when I got married! Morkali is one of them. My conversations with my cousins with whom I had a wonderful childhood, also churn out many delicious recipes long forgotten. I must say it is a very easy one to prepare and I love it for its tangy taste of sour curd! Morkali turns out very soft and is definitely an item of individual palate. In a mixing bowl, Add rice flour and whipped curd to make batter similar to an idli batter. Make sure there are no lumps in the batter. In a skillet (I used a non-stick one, as it requires less oil) add oil (about 2-3Tbsp if using a traditional kadai) and the seasoning. After the mustard seeds splutter, add chopped green chillies and turmeric and saute onions. When the onions turn golden brown, add the rice flour-curd mixture and salt and keep it mixing. It will become a gooey mixture initially but when it is done, it wouldn't stick to the skillet. When the mixture starts turning brown and it doesn't stick to the skillet, switch off the flame and serve hot. Note - If the curd is not sour enough, adding lime juice is optional. This day is celebrated as Lord Rama's birthday throughout India. The grand Sita-Rama wedding ceremony that is performed on this day is a sight to be seen. This day reminds me of the simple yet delicious Panakam, Majjiga and Vadapappu. All these have a refreshing effect and act as great coolants during these sunny days! Naivedyam for today was typically Panakam, Majjiga and vadapappu along with some Tomato pappu and Potato-Bell Pepper curry. Add the grated jaggery to water in a vessel and let it dissolve completely. Add the dry ginger powder and cardamom powder to it. Serve it chilled. Grind the ginger, reen chilli, curry leaves and coriander leaves and add it to the buttermilk. Add oil in a small pan and add the seasoning ingredients to it. When the mustard seeds splutter and the urad dal turns light brown, remove heat and cool it before adding it to the buttermilk mixture. Serve chilled and it is sure to refresh your body. You could add a few drops of lemon too to this. We first got this from Costco (A local wholesale supermarket). These biscuits stirred many memories of his childhood days, and my husband was very happy to be eating those kind of biscuits , known as Palmiers, here in US. Needless to say they are very good. So instead of buying , I thought I should try making those at home and upon googling, I found similar recipes with lot more ingredients. I used the frozen puff pastry sheets by 'Pepperidge farms'. I wanted to keep it simple and tried this. They are very easy to make and requires basic baking skills. So amateur bakers out there, you gotto try this!! Thaw the puff pastry sheet for about 40 min as per the instructions on the package. Combine the sugar and cinnamon powder in a small bowl. Pour and spread one half of the sugar/cinnamon mixture on a flat surface such as wooden board. Unfold the puff pastry sheet onto the sugar and pour 1/2 cup of the sugar mixture on top, spreading it evenly on the puff pastry. Make sure the sugar is evenly spread throughout the sheet. With a rolling pin, roll the dough so that the sugar is pressed into the puff pastry on top and bottom. Fold the sides of the square 1 inch towards the center on both the sides . Fold them again till each of the sides reaches the center. Then fold 1 half over the other half as though closing a book. Now slice the dough into 1 centimeter slices and place the slices, 1/2 inch apart so they don't stick to each other, on baking sheets lined with parchment paper. Refrigerate for a while until the oven is preheated to 400F. Bake the slices for 10 minutes until caramelized and brown on the bottom, then turn with a spatula and bake another 10 minutes, until caramelized on the other side.